Are you planning to elevate or raise the roof, add a dormer, or change the existing roof line on your property? If so, then read on to explore the costs, planning, and ROI on changing your existing roof architecture and design. We give brief details about how each project is pursued. Costs are itemized for those of you that like to know exactly where your remodeling dollars are going. If you prefer the “big picture,” total costs are included after the detailed summary. We also include the ROI, or Cost to Value of the home remodel. This represents how much you’ll get back of the money you spend. For example, if you spend $100,000 on a project and the ROI/cost-to-value is 60%, you can expect the sale price of your home to increase by about $60,000. Of course, ROI doesn’t affect how much you’ll enjoy your home and has little relevance for those not planning to sell anytime soon. The changes can be made for less money than the total cost of upgrading to another home. Moving involves realtor fees of up to 8% on the home you sell, moving expense, the higher cost of the new home and possible remodeling costs to make it what you want it to be. Another option is paying a premium price for a home already remodeled. Those are powerful incentives to invest in your current home instead of moving to a larger home. Let’s go through the four options for changing your home’s roofline – A top-floor addition, a dormer, making more of existing attic space and changing the pitch of the roof. For years, 8’ ceilings were standard. Some older homes have 7’ ceilings. Today, ceilings from 9’ to 12’ are preferred. Let’s explore what it takes to raise a roof to extend interior wall space. Itemized costs are included for each step. The total costs and the return on investment (ROI), also called cost-to-value in the remodeling industry, for raising a roof is listed below. The new structure must be built properly to retain stability. This will include adding full-height studs to the wall and/or sheathing the exterior with plywood or OSB that bridges the existing wall and the new wall. — This eliminates what structural engineers cause a “hinge” in the structure, a place where the lower wall and upper wall meet with nothing to tie them together. $85-$500+ | Having a site plan made to submit to your local building or development department or to your homeowner’s association to get permission or a building permit for the project. The site plan shows how your home will be modified. Did you know? Well-devised site plans are an integral part of any building and construction permit application process. You can get a professional site plan drafted by 24hPlans.com. Use the following code: 24hplans-20off to get a 20% discount off any package. Note, the above 20% discount code is exclusive to the readers of this blog. It’s not being promoted, mentioned, or advertised anywhere else. $450-$1,000 | You’ll need a building permit. The cost of the permit will be determined by what it covers, with construction (framing and finish) and electrical being the most common when simply raising the height of the walls/roof. Stick-built roof structures, common in older homes, are usually demolished and discarded, though if they’ve been sheathed recently and the newer plywood is in good condition, it can be reused. Truss-framed roofs can often be separated and lifted off the home to be reinstalled after the upper floor addition is built. Another option is to remove the roofing material and the roof sheathing, and then take down the trussed individually for reuse. As you can see, there are many options based on your specific home remodeling plans. Here are itemized costs based on what you do. Simply demolishing the roof structure is the cheapest way to remove a roof, but with little or no material saved, the cost of constructing the new roof will be higher. The opposite is true too – carefully removing sheathing and having the trusses removed with a rented crane or by hand for reuse costs more, but significantly lowers the cost of materials for the addition. Once the roof is off, the upper wall section can be built. This work must go quickly when rainy weather is a possibility because the home below is fully exposed to the elements. For this reason, a large crew is used, and a lift is employed for getting wall sections, trusses and materials into place for installation. $14.00-$21.50 per square foot | Cost of framing the wall. The cost varies based on whether the walls are 2×4 or 2×6 construction and the method used to tie the existing and new wall sections together. Once the wall is extended, reused trusses or a new roof system can be installed and sheathed. Chimneys, vents and stacks, if there are any in the space, will have to be extended. Then, the roofing materials and siding can be installed. If the extended wall is just covered with drywall and painted, the cost will be low per square foot. If you add crown molding ($$), wood or faux stone wall covering ($$$) or windows for natural lighting ($$$-$$$$), the cost of finishing your wall addition will rise. The bottom line is that while raising your ceiling height can dramatically affect the appearance of your home, there isn’t a high ROI because it doesn’t add significant practical value to your home. Flat and low-slope roofs are prone to leaks, and depending on the style of your home, might not enhance its aesthetics. Raising the roofline to increase the slope and add the visual appeal of a raised or cathedral ceiling solves both issues. If the home has gables, then they must be extended to fit the new roof line. This project doesn’t return a lot of bang for your buck either. While it does improve the curb appeal of a home and reduce the risk of damaging leaks and expensive repairs, changing the roof pitch just doesn’t have the same value as adding usable space such as a bedroom, bath, bonus room, etc. $450-$1,500 | Building permit. The cost of the permit will be determined by what it covers, with possibilities being construction (framing and finish), electrical, plumbing and mechanical/HVAC. The size of the addition is also a factor – the more square feet of space to inspect, the higher the cost will be. Now, let’s explore the additional costs of adding a second story. $5-$10 per square foot | Adding foundation supports to the home. These might include expanding the entire foundation or adding support piers at strategic weight-bearing locations. Another or additional option might be to add support beams and posts in the basement that will allow the home’s weight to be increased. $1.00-$2.25 per square foot | Adding joists to the existing ceiling to support the new upper floor plus the roof. If the roof is stick-built rather than a truss system, then ceiling joists will be in place. 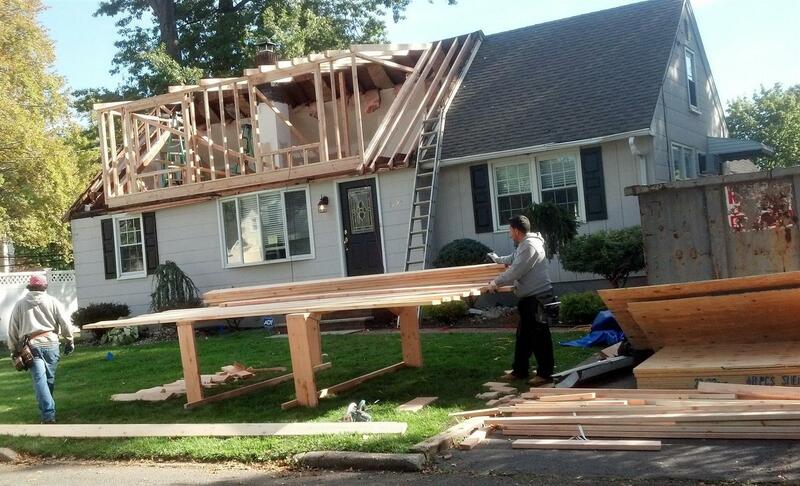 A deck will be installed on the ceiling joists, and the upper floor will be built on the deck. When trusses are removed, then ceiling joists must be installed before the deck is installed and the upper floor is added. 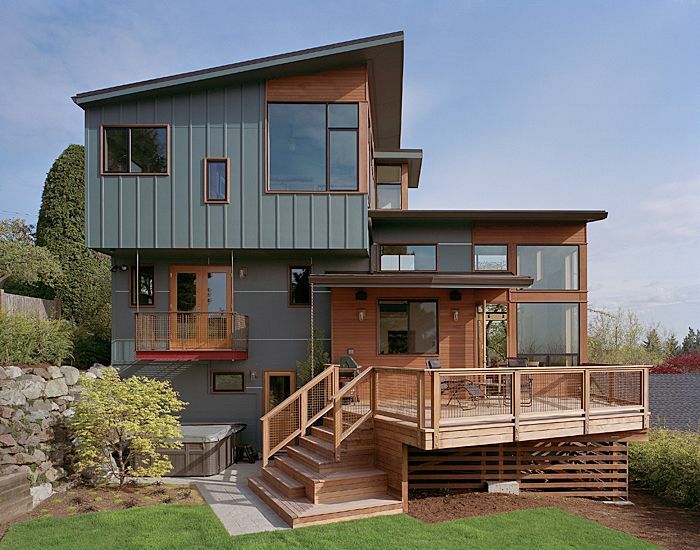 $17.50-$30.00 per square foot | Cost of framing an upper-level addition, a staircase to reach it and the roof structure. The cost is higher on the spectrum for a third story than a second floor and for additions with dormers, very steep pitches and multiple peaks and valleys. Reusing materials will produce a cost lower on this spectrum. Once the walls of the addition are up and the roof deck is in place, the chimney, vents and stacks can be extended. Then, the exterior of the new floor can be finished with siding and roofing material. These prices are for materials that are average to above-average quality. You can always spend more for premium fixtures, flooring, windows and other materials that drive up cost into the $300+ range per square foot. Dormers don’t increase the square footage of the space, but they raise the roof above it, so the space is more usable. Popular uses of the space are as a sitting/reading nook, kid’s play space, dressing area, small bedroom, walk-in closet, small office and storage area. Dormers also allow light into the space, provide a view and improve the aesthetics of a home. A building permit is required ($450-$1,000), and you must have an architect design the plan for your dormer ($250-$500). However, foundational support probably won’t be needed. At most, the architect might require adding a support beam beneath a very large dormer. The higher cost per square foot to frame, side and roof dormers compared to additions is due to their smaller size. Where your dormer falls on the spectrum below will be based on the style of the dormer, the quality of the windows and the building and finishing materials used.